This is our custom-built Specialty "Stereo Y" cable with Gold Locking TRS 1/8" (3.5mm) Male to connectors of your selection. Construction is Mogami 2528 cable, Switchcraft gold 1/8" connector, all other are Neutrik, the Stereo TRS 1/8" Male "Y"s to your selection of connectors (one Left shrink labeled white, one Right shrink labeled red), and options. Neutrik and Switchcraft connectors are some of the best connectors around. Mogami 2528 cable is a dual unbalanced cable in a zip-cord style and is very flexible, durable, light-weight cable. We have an unique setup here allowing you to eliminate adapters and extra cables to extend and adapt standard "Y" cables by selecting exactly the connectors you need. 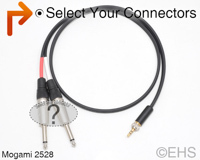 This cable is designed for the Sennheiser bodypack receiver (wireless monitor system) like the EK2000 IEM to feed the signal out to a stereo device instead of headphones. Photo 1 shows a 3' cable with the primary 1/8" and TS as the selectable connectors. Photo 2 shows ends with two TS connectors selected.